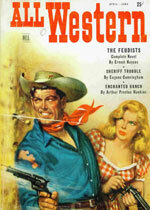 All Western Magazine | Established in 1931 | Dell | Ed. by Arthur Lawson | Total Issues: 94. According to US Copyright law (Title 17, US Code), this item is now in the Public Domain, since its original copyright registration was not renewed after 28 years (Copyright Office, Circ. 15a, "Duration of Copyright"). In countries outside the United States, however, copyright restrictions may still apply.